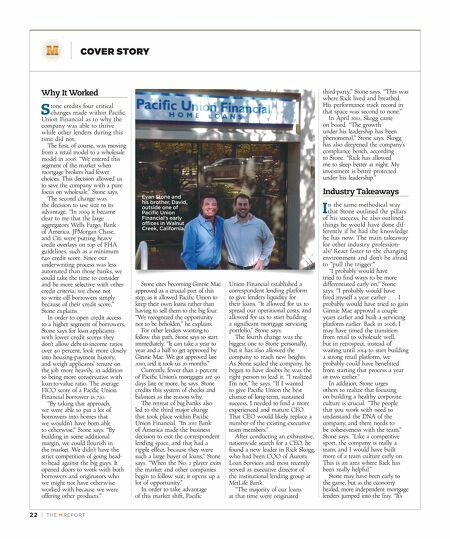 22 | Th e M Rep o RT cover story Why It Worked S tone credits four critical changes made within Pacific Union Financial as to why the company was able to thrive while other lenders during this time did not. The first, of course, was moving from a retail model to a wholesale model in 2008. 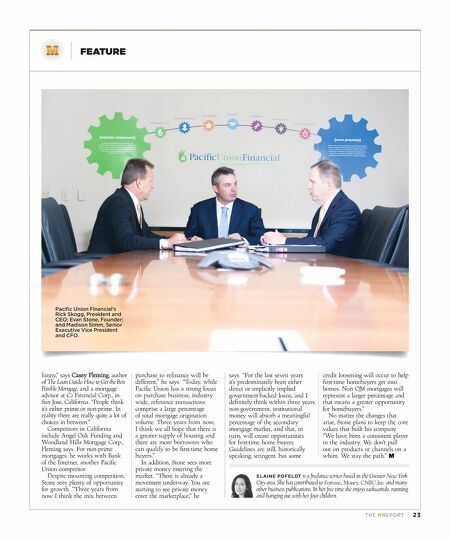 "We entered this segment of the market when mortgage brokers had fewer choices. This decision allowed us to save the company with a pure focus on wholesale," Stone says. The second change was the decision to use size to its advantage. "In 2009 it became clear to me that the large aggregators Wells Fargo, Bank of America, JPMorgan Chase, and Citi were putting heavy credit overlays on top of FHA guidelines, such as a minimum 640 credit score. Since our underwriting process was less automated than those banks, we could take the time to consider and be more selective with other credit criteria; we chose not to write off borrowers simply because of their credit score," Stone explains. In order to open credit access to a higher segment of borrowers, Stone says for loan applicants with lower credit scores they don't allow debt-to-income ratios over 40 percent, look more closely into housing-payment history, and weigh applicants' tenure on the job more heavily, in addition to being more conservative with loan-to-value ratio. The average FICO score of a Pacific Union Financial borrower is 720. "By taking that approach, we were able to put a lot of borrowers into homes that we wouldn't have been able to otherwise," Stone says. "By building in some additional margin, we could flourish in the market. We didn't have the strict competition of going head- to-head against the big guys. It opened doors to work with both borrowers and originators who we might not have otherwise worked with because we were offering other products." Stone cites becoming Ginnie Mae approved as a crucial part of this step, as it allowed Pacific Union to keep their own loans rather than having to sell them to the big four. "We recognized the opportunity not to be beholden," he explains. For other lenders wanting to follow this path, Stone says to start immediately. "It can take a year to year and a half to get approved by Ginnie Mae. We got approved late 2010, and it took us 20 months." Currently, fewer than 2 percent of Pacific Union's mortgages are 90 days late or more, he says. Stone credits this system of checks and balances as the reason why. The retreat of big banks also led to the third major change that took place within Pacific Union Financial. "In 2011 Bank of America made the business decision to exit the correspondent lending space, and that had a ripple effect, because they were such a large buyer of loans," Stone says. "When the No. 2 player exits the market and other companies begin to follow suit, it opens up a lot of opportunity." In order to take advantage of this market shift, Pacific Union Financial established a correspondent lending platform to give lenders liquidity for their loans. "It allowed for us to spread our operational costs, and allowed for us to start building a significant mortgage servicing portfolio," Stone says. The fourth change was the biggest one to Stone personally, but it has also allowed the company to reach new heights. As Stone scaled the company, he began to have doubts he was the right person to lead it. "I realized I'm not," he says. "If I wanted to give Pacific Union the best chance of long-term, sustained success, I needed to find a more experienced and mature CEO. That CEO would likely replace a number of the existing executive team members." After conducting an exhaustive, nationwide search for a CEO, he found a new leader in Rick Skogg, who had been COO of Aurora Loan Services and most recently served as executive director of the institutional lending group at MetLife Bank. "The majority of our loans at that time were originated third-party," Stone says. "This was where Rick lived and breathed. His performance track record in that space was second to none." In April 2012, Skogg came on board. "The growth under his leadership has been phenomenal," Stone says. Skogg has also deepened the company's compliance bench, according to Stone. "Rick has allowed me to sleep better at night. My investment is better protected under his leadership." Industry Takeaways I n the same methodical way that Stone outlined the pillars of his success, he also outlined things he would have done dif- ferently if he had the knowledge he has now. The main takeaway for other industry profession- als? React faster to the changing environment and don't be afraid to "pull the trigger." "I probably would have tried to find ways to be more differentiated early on," Stone says. "I probably would have fired myself a year earlier . . . I probably would have tried to gain Ginnie Mae approval a couple years earlier and built a servicing platform earlier. Back in 2008, I may have timed the transition from retail to wholesale well, but in retrospect, instead of waiting until 2014 to start building a strong retail platform, we probably could have benefitted from starting that process a year or two earlier." In addition, Stone urges others to realize that focusing on building a healthy corporate culture is crucial. "The people that you work with need to understand the DNA of the company, and there needs to be cohesiveness with the team," Stone says. "Like a competitive sport, the company is really a team, and I would have built more of a team culture early on. This is an area where Rick has been really helpful." Stone may have been early to the game, but as the economy healed, more independent mortgage lenders jumped into the fray. "It's Evan Stone and his brother, David, outside one of Pacific Union Financial's early offices in Walnut Creek, California.